Earlier this year, I talked a little about various methods for marking fabric, such as chalk pencils, marking pens, and so forth. (Sewing Tools: Things to Know Before You Buy) Frixion erasable pens are quite popular these days, since the ink is heat sensitive and will vanish when you press your garment. The thing is, you have to be careful to test them first, because the marks don’t always disappear. I’ve encountered some disbelief as to this fact, so here is an example. See the white smudge at the top corner? That’s where I’d marked the pivot point. You can see another white dot near the end of the seam on the right. This is AFTER I’d pressed the fabric, so those marks shouldn’t exist. Now, in this case, it’s the lined yoke of a doll skirt, so it’ll be totally enclosed and no one will ever see these wayward marks. But what if you’re marking darts? Or any other kind of marking that might be visible from the right side of the garment? 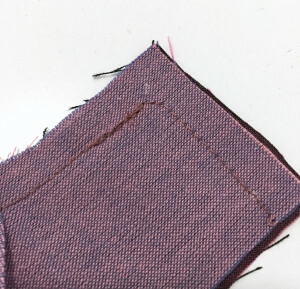 In judging sewing competitions, I’ve seen many garments where there are visible chalk or ink marks at the dart points, buttonholes, and other areas. Not all of these were sewn by beginners, so it’s a common problem. Solution: Always test your marking method! Make sure the ink or chalk will disappear before you use it. Yes, even Frixion erasable pens. If you can’t find a pen or pencil that vanishes properly with your fabric, try tailor’s tacks. I LOVE the Frixon pens and markers for my sewing. I have encountered the “white mark effect” a time or two. Like all things, you have to TEST before you use.